Damon and Elena are cuddled up and enjoying their moment. Silas walks in and is so happy to be alive and a witch and looking forward to dying. Stefan is in the presence of Tessa. Tessa is looking forward to killing Silas but realizes she is spellbound to the house. Silas is looking for the anchor and it is located in NJ. Jeremy shows up and does not believe Silas is going to just bring back Bonnie. The travelers do not want Silas to be reunited with Amara. 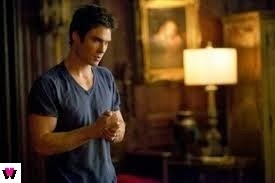 Silas tells Elena that she has to stay back. Elena shows up to the cabin to check on Stefan and ends up stuck in the cabin with him and Tessa. First grey hair and now a tooth falls out, poor Katherine is falling apart. Katherine is crashing with Caroline. 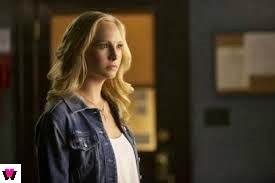 Katherine offers to help Caroline with Dr. Maxfield. Dr. Maxfield is doing his study. Caroline and Katherine knock him out. Katherine and Caroline begin to bleed Maxfield. Katherine is going to infiltrate the secret society to prove that Elena is human. Bonnie and Jeremy special moment. Tessa threatens to kill Elena if Damon does not kill Silas asap. Damon and Jeremy fall apart and admit that they have to kill Silas. Travelers show up and do a spell on Damon that makes his daylight ring stop working. Secret society is called Augustine. You are invited into the society by nepotism and there is a vampire by the name of Augustine that they have. Amara is the anchor! Well played Tessa. That makes 3 Elenas running around! Amara stabs Silas and drinks his blood for the cure. Silas is missing but is alive somewhere out there. Katherine goes to Maxfield for help to live and blackmails him for help. Amara is slightly crazed. They need to protect Amara since she is now human. Tessa is in Stefan's room. She gives Stefan back all his memories. She tortures him with his memories and reminds him that she was the one that saved him from drowning not Elena or Damon. Sounds like it is pretty obvious that the anchor is a person that Silas will not want to kill and look its Amara. Silas and Memory loss Stefan are kinda alike in my opinion. I do enjoy Katherine and Caroline working together. 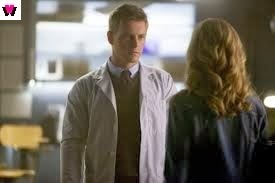 They are the ultimate schemers and if Katherine was smarter in the beginning when she first turned her she would have utilized Caroline better. I am still holding on to my theory that Elena's father is part of the society. Maybe he is the Augustine vampire or the reason why he is a vampire. Especially once they said that you are invited due to a relative and that they were interested in Elena being part of the club. 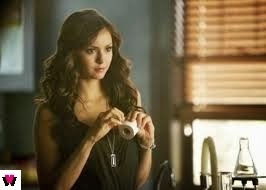 I wonder what is going on with Katherine and if she can be saved. She have been through too much and survived too much to die now! Welp, until next week.